Here’s a quick and easy to read guide that will help you pick the right website hosting company and domain name registrar. This guide assumes you have no prior experience so you’ll be up and running no matter what by the time you’re finished reading. It is based on my experiences designing and developing simple and advanced websites for hundreds of clients across many industries from 2000 to 2019. Website hosting involves the actual computer, known as a “server”, set up to store your website files and serve them out to visitors on the Internet. Some companies host their website internally and some host their websites through 3rd party companies. In 2019, most small and medium-size businesses use a 3rd party company to provide their website hosting. The main reason so many companies use a 3rd party company to host their website files is because they can save money and get better results. The best web hosts actively take care of security issues with the software that runs on their servers, automatically perform daily backups, have fast connection speeds, can deal with large amounts of visitors, and provide fast and friendly customer service. 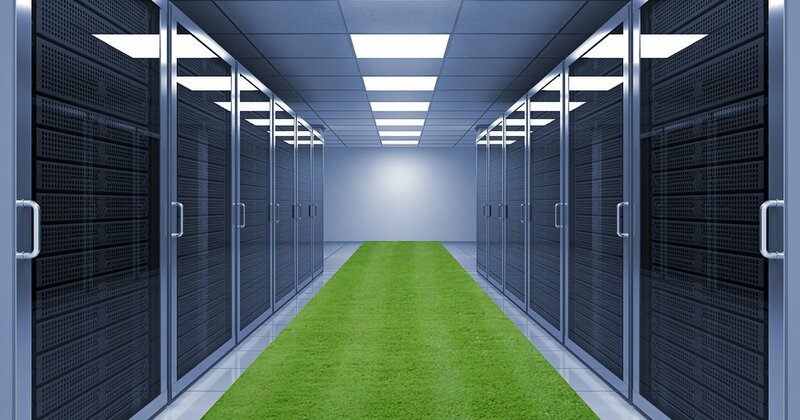 Larger companies with more resources may opt to host their website on their own servers. They may choose this for extra security, but have the internal manpower and know how to deal with making sure their servers are properly run. Which company should host my web site? 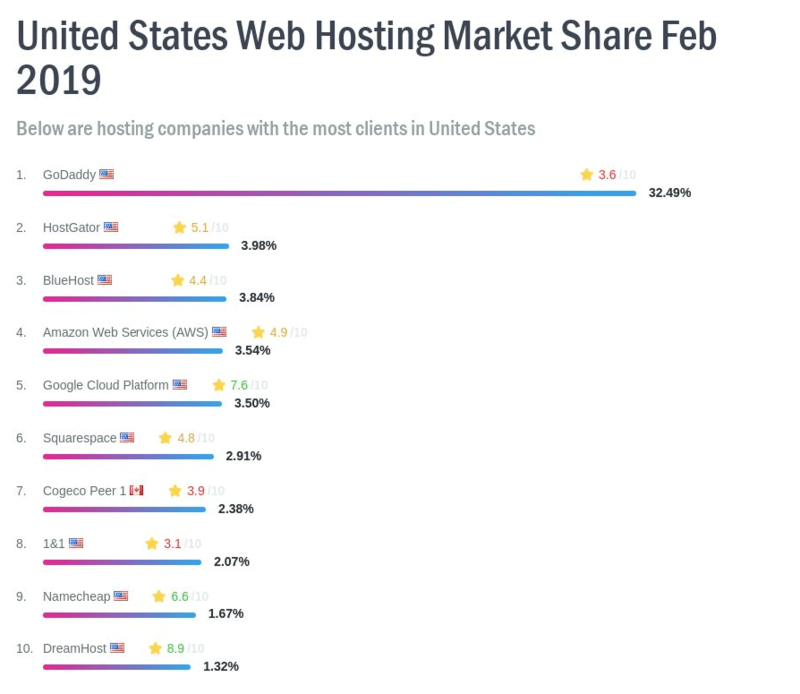 In 2019, it seems like there are a million options for website hosting. Cheap website solutions are a dime a dozen these days. It’s not unheard of to see $2.99/mo. deals with unlimited space and unlimited bandwidth. While these deals seem amazing, you end up dealing with slow connection speeds in many instances, broken control panels, unreliable backup and recovery processes, and clunky feature implementation. Just like everything else in life, you get what you pay for! The funny thing about this whole situation is that web hosts with reasonable quality can be had for around $30/mo and up. This is less than a typical cell phone bill these days, but I guess the lure of $2.99/mo. is just too enticing for some people. Check out this market share graph below. You’ll see a bunch of “popular” website hosting companies listed there. Notice too how low their review scores are! While GoDaddy is the market leader, they are such a pain to deal with. Every process you initiate in their back end panel gets thrown into a queue and takes forever to actually go through. I actively recommend all of my clients against using GoDaddy for website hosting. HostMonster and Bluehost are like clones of each other in my opinion. They offer cheap hosting, but their back ends break all the time and you get stuck with tech support that can’t help. Amazon Web Services and Google Cloud Platform are top notch solutions but may be too technical for small and medium-size business websites. They are great though if you’re building custom web software. Since we primarily deal with U.S. based clients, we haven’t used Cogeco Peer website hosting. However, it is rated lowly so my suspicion is it is like the other bottom of the bucket website hosting solutions. Rounding out the list are Namecheap and Dreamhost. I typically lump Namecheap in with the other low-cost hosting solutions. Dreamhost has been good to some of our clients over the years. I don’t actively choose them though since I think there are better and more specialized solutions these days. Generally, two website companies get the Clicked Studios recommendation these days. The first one is WPEngine. It is a specialized website host for WordPress based websites. The custom WordPress websites we build on their platform always work and there are no headaches. There are 14-days of backups that can be instantly restored with a single click. There’s a staging area that can be migrated to live with a click. Life is easy with WpEngine. On the rare occasion when we have to talk to their tech support, they are able to offer a solution quickly that fixes the problem. When we have clients who are not WordPress based, Clicked Studios tends to recommend Media Temple VPS solutions. A VPS means “virtual private server”. It is like getting access to a fully customizable server without having to pay for an entire server to be dedicated to you. Within the server, the web hosting company runs software so you get a piece of the server’s resources while in practical terms you can customize your zone however you want. This means you can control the operating system, the software installed on there, security policies, and beyond. Since we send so many clients to these companies and don’t offer website hosting directly, some the links have affiliate codes so we get credit if you become a customer of theirs. Many consumers mix up domain names with website hosting. A domain name and website hosting are two separate things. A domain name is just a word or phrase you license from a registrar. Once you acquire the domain name, you must then tell it where your hosting company’s computers are. It is best to think of your domain name as a street sign pointing the way to your store (the server at your website hosting company). Sometimes people look for the cheapest company when looking to purchase a domain name. Generally, this is a bad idea because super cheap companies provide hard to use administration panels, make it hard to transfer your domain, and lock out their users every now and then. The best solution is to go with a reputable domain registration company that only charges a dollar or two more. These few extra dollars will go a long way in avoiding time-consuming, frustrating headaches and delays related to domain name administration. Who should I use for my domain name registration? GoDaddy offers some of the best prices in the domain name marketplace. Managing the domain through the administration panel is easy. Transferring domain names is also hassle-free. You might also look at Network Solutions, Register.com, and eNom.com for registering your domain name. While I don’t personally choose them, I’ve had many clients use them without issue. MOst the part, once you’ve bought a domain name and pointed it as your website hosting account you never have to touch it again. The hosting and domain companies discussed above are more than adequate for most business. If you envision your web site serving tens of thousands of visitors or maybe even millions with a custom app, you’ll want to consider something like Amazon or Google cloud hosting packages. Most B2B and B2C companies will be happy on a customized WordPress website running on WpEngine or similar. Avoid using the really cheap website hosting solutions from GoDaddy, HostGator, Bluehost, and 1&1 unless you want to deal with headaches while using their control panels and talking to customer support. Website hosting is not an area where you want to be penny wise and pound foolish. Photo courtesy of Tom Raftery.